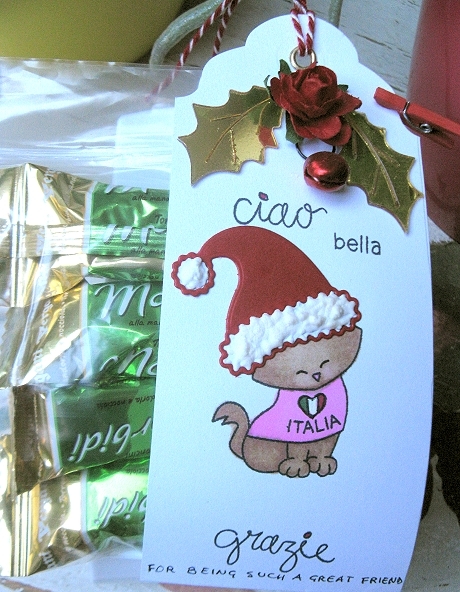 What a beautiful tag/gift bag, complete with an Italian sentiment! I'm loving the gold holly leaves with that pretty rosebud, and that little kitten is just adorable with the furry Santa hat! What a great little gift to give a friend with goodies inside :) I love it!! Che bella etichetta natalizia hai fatto per il regalo di cioccolato dei tuoi amici, sono sicuro che ha reso il regalo davvero speciale. Sono d'accordo che Sizzix muore, sono davvero tra i migliori e mi piacciono particolarmente quelli che hanno fatto per Tim Holtz, ne ho alcuni. Sono lieto di vederti alla sfida di Allsorts questa volta, grazie mille per esserti unito a noi. This tag is gorgeous!! Love the sweet little kitty!! Thanks for joining us at DCD this week! Hello, Alice! This is absolutely adorable! I love the Italian kitty with the Santa hat, so cute! 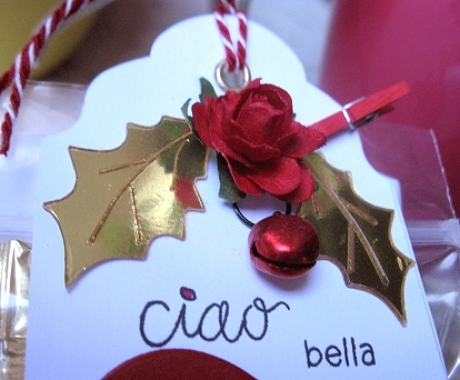 The tag is gorgeous with the gold leaves and little bell! I think your friend must have loved this thoughtful and yummy gift! Have a wonderful day, dear friend! What a sweet tag! Great job! Thanks so much for playing in our Merry Little Christmas Challenge! Good Luck and I look forward to seeing you again next month! Oh my goodness this is just so beautiful and love the cute kitty. This is such a great idea for a wee gift for a friend...or a friends kids. I can see some little sets of eyes lighting up at the sight of the sweet critter and the hidden candy! A really super tag with a lovely cute image and embellishments. Thank you for joining our 'Tag' challenge at Allsorts. Such a pretty tag, an adorable image. 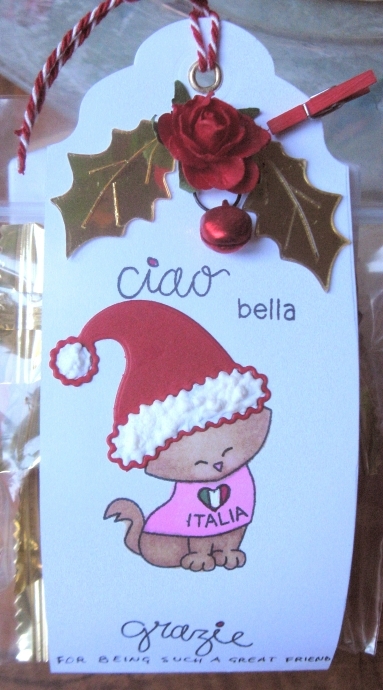 This is so cute and festive, love how you personalized it with Italian words and the cat’s tee. Ma che dolce! Una bella idea anche per l'anno prossimo. Such a sweet tag, thanks for joining us over at Merry Little Christmas challenge blog!